Visitor areas in the State Forests of the Lower Barrington Tops can be found in Chichester State Forest. Chichester is divided into two distinct areas, the western side centred on the Allyn River and the eastern side centred on the Telegherry River. Access to visitor sites along Telegherry River is via Chichester Dam Road from Dungog. Visitors can turn right into Wangat Road to travel into the forest. Forests in this area have been harvested many times over for timber, for many decades – some for over 150 years - meaning the forests you see today are regrowth forests. Our forests are valuable resources for timber, biodiversity and visitor enjoyment, and so we ask all visitors to please look after these areas - take only photographs and leave only footprints. On the way to Telegherry Forest Rest Area you will find a small, open air museum of old logging machinery. This is an excellent reminder of how logging equipment and practices have advanced over time. Telegherry Forest Rest Area contains separate picnic and camping areas beside the river. 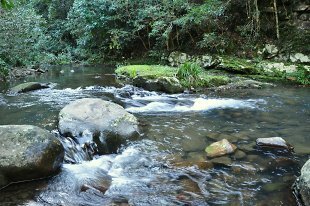 There are a number of short walking tracks leading into the surrounding forest and areas of river/creek that are popular spots on a hot day. For visitor safety and protection of the environment, please note that following wet weather Telegherry may be closed to the public and the gate will be locked. Check for closures by emailling visit@fcnsw.com.au. Frying Pan Creek is a picturesque and very popular camping and picnic area on the banks of the fast flowing Telegherry River. A two kilometre return walking track to Problem Creek Falls starts from this site, and is maintained with the help of the "Friends of Chichester". Frying Pan is also well liked by trail bike riders – click here for guidelines. Currawong is a particularly quiet camping spot away from the larger visitor areas. Currawong offers easy access to the Telegherry River for paddling or li-loing. Visitors please note that Currawong camping area can only be accessed by 4WD due to a river crossing that quickly varies in depth after rainfall.